What makes GREAT LENGTHS hair superior? Unsuitable and improbable for quality hair extensions. Unsuitable for quality hair extensions. Strand Application. 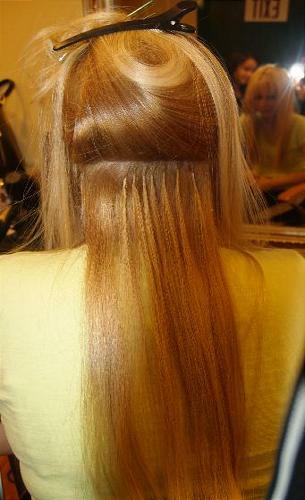 GREAT LENGTHS have created an extremely high-tech method of bonding between the Great Lengths strand and your own hair. This point of attachment is composed of polymer chains whose molecular structure is very similar to that of human hair. It is activated by our Great Lengths applicator and bonds the Great Lengths strand with your own hair in this way. It can, however, be easily removed by an expert! Most important of all: your own hair is not damaged. This patented attachment of Great Lengths to your own hair offers you perfect freedom in organizing your leisure time and in your freedom of action but in no way compromises the quality of your own hair! Since 2008 Great Length hair extensions has maintained it’s title as the stylist choice award winner due to their superior product, education, ethics and therefore is recognized as the Expert for hair extensions. These extensions are exceptionally safe, virtually impossible to detect and offers tremendous versatility. -Over 40 vibrant natural shades, lengths 8 to 24"
Great Lengths hair extensions come in a wide variety of shades & can be custom blended for you. Accommodating an individual's hair density can be achieved by creating fine, extra fine and custom sized bonds. Call for your free extension consultation to decide whether a full head lengthening, volumizing, highlighting or zonal volume application is right for you. Great Lengths offers over 40 vibrant natural shades to precisely match the color of your own hair. Strands are available in lengths from 8 inches to 24 inches. Great Lengths® Standard extensions, our most popular selection. 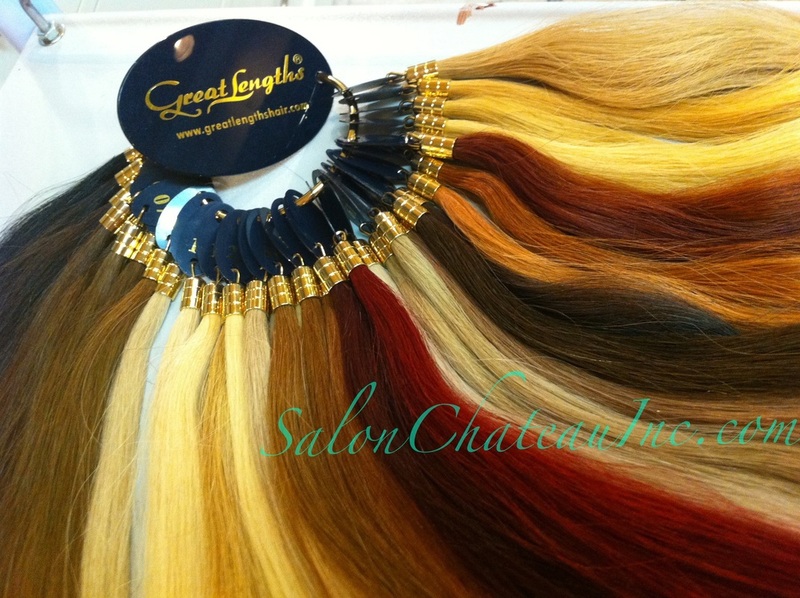 These extensions are available in 8 lengths and 35 shades. Made from the absolute best human hair, and only available through certified Great Lengths® Salons. lengths. Add a touch of bright color with Great Lengths® Fashion Strands. 14 fantastic colors that will add pizazz to any hair. Siam, Crystal, Capri, Pink, Green, Topaz, Onyx, & Purple. The Crystal Strands can be in clear or natural colors to match your base hair color. Consult your Stylist for your best choice. Great Lengths are 100% natural hair extensions which since 1991 have achieved international recognition and success in over 45 countries. Great Lengths uses only 100% human hair which has a slight natural wave yet is easily straightened and styled into your desired look. After extensive research Indian hair was chosen as the superior and most suitable hair for extensions that will blend in perfectly with your own hair and look superbly natural. Great Lengths uses a patented system which pre-bonds the hair to ensure easy application and long lasting results. The patented protein polymer bond used allows for compatibility with the elements your hair encounters such as heat, water and sunlight. Most importantly after the bonding is dissolved using the Great Lengths removal solution your hair is in a natural state with no damage to the cuticle. Great Lengths uses advanced technology at their laboratories in Italy to transform the hair without damaging it. The depigmentation method takes from 15 to 20 days. This allows the hair pigment to be released slowly and uses no peroxide or ammonium derivatives which damage the structure of the hair. The choice of colors, lengths, thicknesses and decorative strands allows for hundreds of possibilities for your truly unique and personalized head of hair. There are 40 natural shades, 14 fashion alternate colour shades and Diamond strands, which use Swarovski crystals to choose from. The hair can be further personalized to exactly match your natural color and style as it is 100% human hair. The color, length, cut, style, finished look, maintenance and pricing must all be decided. There is a choice of four lengths ranging from 30 to 60 centimetres, depending on how many strands needed the price will vary for the desired look. With regular maintenance which includes brushing daily with a soft bristle brush, the extensions can last up to six months. However it is recommended that after approximately 3 months some strands will need to be replaced. The numerous benefits in using Great Lengths Hair extensions allow for hair that was once ordinary to become the hair you have always dreamed of. The strength and body of the Great Lengths hair allows for transformed texture, volume, color effects and length with hair design options that are only limited by your imagination.